The Shows: Cult Kids TV and Cult TV Comedy. Produced: Granada for syndication via ITV regions throughout the UK. A Kind Of Loving - A Synopsis. Vic Brown, the son of miner, lives with his parents in the West Riding of Yorkshire. He is employed as a draughtsman in the rather stuffy office of an engineering firm. Only a couple of years into his apprenticeship with the firm, Vic is already feeling stifled by the staid environment. One of the very few things to brighten up his working day, is the appearance around the office of an attractive young typist named Ingrid. Vic plucks up courage to ask Ingrid out, and she agrees. After a few dates it becomes clear that Ingrid has completely fallen for Vic, but that Vic is not sure how he feels for Ingrid, and is certainly not eager to settle down into marriage. Meanwhile, Mr Van Huyten, the boss and owner of the music shop where Vic is employed on Saturdays, sounds Vic out as to whether he would be interested in working full time at the music shop. He advises Vic that although his wages wouldn't better those of draughtsman, he would in time leave Vic in charge of the business and would leave the business to him when he retires. So, foregoing the wage hike he would shortly receive at the engineering firm, Vic resigns his draughtsman's job and goes to work full time at the music shop. Vic's relationship with Ingrid trundles along, with Vic still unable to work out his true feelings for her, while Ingrid is seemingly very keen to make the relationship more permanent. Before either of them have much time to consider their relationship, Ingrid discovers that she has fallen pregnant. Vic knows that despite all his protestations about never marrying, both his and Ingrid's families, and the close-knit community itself, will expect the couple to marry. Despite his apprehensions, Vic agrees to do the honourable thing and marry Ingrid. As the couple can't afford a place of their own, it is agreed that they live at Ingrid's parent's house after they marry. After the honeymoon, Vic moves in to his inlaws house, but with Ingrid's father working away for much of the time, Vic finds himself stuck at home in a stifling atmosphere with Ingrid and her domineering mother. Ingrid falls down the stairs at home and suffers a miscarriage. In the following months, the tense atmosphere between Vic and his mother-in-law reaches breaking point. With the loss of the unborn baby there is little to keep him stuck in the house, and decides he can't continue living with Ingrid in her parents house, and so decides to split up with her. After a plea from his father-in-law to return to Ingrid, and the fortuitous opportunity for Vic to rent his own flat, Vic agrees to give their marriage another chance, and the couple move into flat. Mr Van Huyten dies suddenly, but in his will Vic is only bequeathed a small sum of money, rather than the music shop that had been half-promised to him. Vic subsequently receives an offer of a draughtsman's job down south from one of his old draughtsman pals, and he is keen to make a clean break from his home town. Ingrid is much less keen, she is settled and her mother is now suffering ill-health. After some persuasion Ingrid agrees to let Vic take the job, which will mean in the short term Vic working away and returning home every few weekends, with a view to Ingrid moving south to join Vic in the future when her mother returns to full health. Vic settles happily into his new job, and in the evenings gains friends from a local group of theatre actors. Vic gets to be particularly fond of one of the group, Donna, who he instinctively feels is everything that Ingrid is not, and also feels that he has much in common with her. With the friendship progressing, Ingrid receives a poison pen letter advising her that Vic and Donna are having an affair. Armed with the letter, Ingrid awaits Vic's return to confront him over the letter and her own suspicions. The Cult of... A Kind Of Loving. 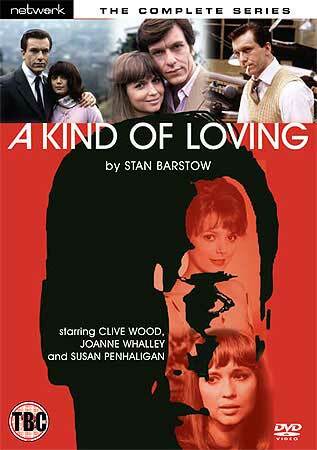 A Kind of Loving is a 10 part series adaptated by Stan Barstow based upon his own trilogy of 'Vic Brown' novels - A Kind Of Loving, The Watchers On The Shore and The Right True End. The series follows a story spanning some fifteen years from December 1957 through to October 1973. Like its predecessor, the 1962 cinematic adaptation of the first novel A Kind Of Loving, the series was an immediate ratings winner when it was originally screened in 1982, regularly pulling in 15 million viewers throughout its run, and it was only kept off the number one spot in the ratings by fellow Granada production Coronation Street. The basic story follows the protagonist and anti-hero Vic Brown, but it also neatly documents changes in social attitudes from the late 1950's to the early 1970s. The story starts on the very cusp of the changing of the old guard, where both full employment and the 'invention' of the teenager, suddenly had given young people the kind of freedom, and more significantly, freedom of choice, that they had never previously enjoyed. Unfortunately for Vic, this freedom was to be short lived with his hand being forced into married life with Ingrid's unplanned pregnancy. By the end of the story, the whole world seems to have changed, the freedom Vic enjoys is thanks in part to his well paid job, his bachelor lifestyle and his past responsibilities that have long since been relegated to mere memories. It is little wonder the series was such a success, a small but superb cast carries the nicely meandering story. Clive Wood (London's Burning) takes the lead wonderfully, and rather convincingly portrays Vic from a 20 year old through to a 35 year old. A special mention has to go Joanne Whalley (also known as Joanne Whalley-Kilmer) who gives a stunning performance as the 'small town girl' Ingrid Rothwell, who is in love with Vic but, with her lack of ambition and interests, is ill-equiped to please him. It is unsuprising that Joanne Whalley would eventually turn out to be a big star, firstly for her notorious and lauded appearance the The Singing Detective and Scandal, but also for her excellent portrayals in lesser know works The Big Man and the wonderful Screen Two play from 1987 Will You Love Me Tomorrow (one of the best TV plays never to receive a commercial release - someone please release this excellent production on DVD). The scope of the story is particularly impressive. With ten 50 minute episodes mainly concentrating on Vic's work and domestic life, it allows the story to grow organically in a pleasingly unrushed manner that modern audiences simply are not permitted to see in today's TV dramas. The story is slightly unbalanced, in that the first 8 episodes cover the five years from 1958 to 1963 with the final two episodes picking up the story in 1973. This is not as much of a problem as it may seem, with the final two episodes being both the least interesting part of the whole story, and also shedding scant light (less than a couple of sentences) on the intervening 10 years. Another wonderful facet to the series is the theme tune and incidental music by TV veteran Derek Hilton, a marvelously strong theme that, although is sparsely used through the series, perfectly underscores the underlying emotion of the series. Some minor niggles about the series - There are more than a few instances in the series where the story is so telegraphed that one is left in no uncertainty what is about to happen. No doubt this is due to a need to keep the narrative moving along, but given the length of the series, it surely could have been realised with a little less hand-feeding of the viewer. The other aspect that, more than anything else helps date the production, is the long freezes at the end of each the episode breaks. Some of these even become 'Acorn Antiquesesque' with the actor left staring into space for an increasingly uncomfortable length of time. Those are the only faults in this hugely entertaining landmark series which we cannot recommend highly enough. To an army of fans who saw the series when it was first transmitted, this is an eagerly awaited DVD release. It is a mark of how much fondness the series is held in that there has even been an internet petition with over 650 names collected from the last 2 years, demanding it's release. Luckily for us, the lovely people at Network have given this wonderful series a commercial release, and has it ever been worth the long wait. I was aware of the wonderful 1962 John Schlessinger film, and so was intrigued to watch the series. Although the series has a significantly different feel from the film (and also the film only covers a third of the story), I was instantyly gripped by the story from the very first episode. So much so, it took a considerable amount of self discipline not to watch the whole series (some 8 and a 1/2 hours) in one sitting. Watching the series on DVD it became sadly apparent that no recent TV drama series have been brave enough to allow a story to develop so organically, instead they seem compelled to propel themselves headlong into the next 'action' "chapter point", with little enough time for the emotion of the characters to develop. This DVD release by Network, is to be very much commended. They will have made a loyal legion of fans very happy with the release, but also in time, will hopefully introduce a whole new audience to, in our opinion, one of the very best series to come out of that rich vein of late 1970s / early 1980s drama. We cannot recommend the series highly enough, with its meandering storyline, and its superb cast. It's unfortunately true that "they don't make 'em like this no more", but with its release on DVD, we can thankfully experience this wonderful series in all its glory.